It’s useful to start by understanding why and when selective soldering is used. There’s a misconception that it is a newer, better way to go than wave soldering, and nothing could be further from reality. They are two entirely different types of solder techniques for very different kinds of applications. Whereas wave soldering is used extensively for economical and secure soldering of boards with only through-hole components, selective is used on boards with a mix of surface mount and through-hole populations. Wave is still the fastest, most effective method for processing throughhole components because it comes in contact with the whole surface of the board at once; selective tends to be considerably slower because it’s soldering individual leads or closely spaced components one joint -- or set of joints -- at a time. Hybrid boards exist for a number of reasons. In spite of the proliferation of surface mount components which are perfect for high density functions on smaller and smaller footprints, through-hole devices are still preferred for high power applications and those with connectors which require a very strong, stable joint. Check out DDM Novastar's wide range of Selective Soldering Machines. Selective soldering acts on the underside of the board without affecting anything on the top. A board is positioned in a frame, and all subsequent operations occur automatically according to the process control system programmed in advance for that board. In addition to a single point, selective can be designed to perform “dips” and “drags.” These are closely spaced joints that can be handled by the same soldering operation either by covering multiple points in a single dip, or by swiping a row of joints in a long connector, for instance, by dragging the solder tip across them. While there is often no other practical way to handle boards with hybrid components except manual soldering, selective soldering has the usual set of advantages and disadvantages. Pros: Near-perfect joints, lower labor and rework costs than manual, reduced training and staffing costs for skilled hand labor, excellent joint consistency, high production efficiency. Cons: Generally more expensive than wave, although their costs have been coming done recently as they’ve become more popular; speed is relatively slow compared with wave, but considerably faster than manual soldering in a production environment. Two types are available: Spray and Microdrop. The Spray type is generally faster, has been time-tested over many years of service, and has higher solids flux capability. Downsides to Spray are: it leaves more flux residue, requires more maintenance and has more wear parts that may need replacing. Microdrop fluxing is more accurate, provides better hole filling, leaves little residue and is generally maintenance free. However, it costs more, runs a bit slower and is more complicated to program. Preheating minimizes thermal shock before soldering. 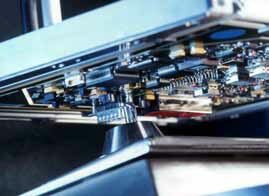 Preheat systems can be integral with the selective soldering machine or offered as an optional module. Quick IR, Area IR, and Area Quartz techniques are available, and can be employed on both the bottom and the top of the board. Area Quartz is usually specified for thick boards. IR provides quick response and is gradient controllable, whereas some form of convection delivers a lower gradient but a more uniform heat transfer quality. A combination of the two may be used for high thermal mass applications. There are three common types of soldering technologies available: Jet Wave, Wettable Nozzles, and Hybrid (Mini-Wave and Dip combination). Jet Wave is similar to wave soldering in that it’s directional and has the same benefits as wave. Its smallest solder diameter is 4mm, it requires minimal maintenance, and it is fairly low cost. 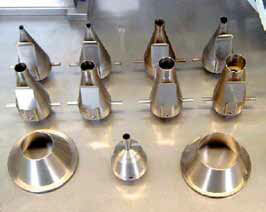 Wettable Nozzles solder in every direction, 360 degrees, or in either the x or y direction. It is easy to control the wave height, and its smallest diameter is 3mm. It costs more than Jet Wave and requires daily maintenance. As covered in prior chapters on Wave soldering, there are a variety of flux types and chemistries available, including low pH, high-solids content, and water soluble, alcohol-based, and others. Selection of a particular type of flux is frequently not an option for the contract manufacturer, since it is usually determined by the end-user’s application, so they must be able to accommodate work using many types of flux. No-clean fluxes are generally preferred because they require little to no post solder cleaning, except for a visible residue that should be removed. If the user opts not to use a no-clean flux, it is very important to control the amount of flux applied to the board. In most cases, controlling the solder head to cover the area previously sprayed will burn off the flux and eliminate the necessity of cleaning the residue in a subsequent step. Remember that solder types used for selective must be compatible with solder used on the top of the board, and this will likely have a material effect on the flux type used. Compatibility of materials of construction: Make sure the application technique is compatible with your flux chemistry. Motion and speed of the spray head: The faster or slower the spray head moves, the leaner or heavier the deposition will be. Flux flow rate delivered to the spray head: Will affect the quantity of flux deposited on the board. Pitch pattern between spray strokes: Determines whether consistent coverage will be achieved over a wide area. Spray pattern: Check for controls that will help minimize overspray and waste while targeting the critical areas to be covered. In a spray fluxing system, flux can either be delivered by ultrasonic energy or by pumping from a canister in a housing below the machine into a spray head where it’s atomized with air. Nozzle-free spray heads are preferable because they are less likely to clog. Spray is delivered in a cone shape, in a variable band of material onto the board. The narrower the band, the more likely flux will be directed into the plated holes. While it covers a lot of real estate, a wider band doesn’t necessarily penetrate deeply into the through-hole to get good flux coating in the fillet. Another important factor for effective spray fluxing is the speed and position of the spray head. Fluxers with reciprocating heads provide a greater opportunity to direct flux to plated holes from a variety of angles, and electronically driven heads are more apt to overcome issues with sticking due to flux residue and airborne contaminants than pneumatic systems which are more susceptible to this problem. Finally, evaluate the fluxing system based on its construction attributes. A self-cleaning system will reduce downtime for maintenance. A robust machine will perform continuously without excessive maintenance attention. A micro-jet (or drop-jet) fluxing system sends an undiluted bead or bubble of flux directly through the fillet, the thru-hole and the solder ring of the circuit board in droplet form. A micro-jet system will generally use less flux than a spray system because it’s only applying flux precisely where it’s needed. Most systems allow for a variety of dot patterns which are pulsed through the nozzle, ensuring accuracy. Micro-jet technology provides very fine control of bead size and positioning, thus reducing liquid media waste and virtually eliminating post solder cleaning. An advanced micro-jet flux system is capable of depositing precise amounts of liquid flux with extremely high accuracy, achieving pinpoint thru-hole penetration, with no wasted overspray. In the early years of micro-jet fluxing, designs were adapted from currently available ink-jet printer technologies, and often were not as well suited to the PCB market as needed. However, as the technology matured, dedicated designs have been developed that were (and are) better suited as integrated systems in the selective soldering machine. 1. Programming is typically more complicated and time consuming; however, once programmed, repeatability is excellent and the recipe can be stored for producing the same boards again in the future. 2. Initial cost of a micro-jet system is higher than spray fluxing, but again, with its added efficiency, pinpoint accuracy and long-term reliability, this cost can often be made up very quickly in a production environment. One of the most important technical considerations is the actual control software of the manufacturer, as this is more important than the control of the fluxer itself. Both the spray fluxer body and the micro-drop fluxer body can look identical – it’s only the methods of dispersement that differ. It’s important to remember that Selective Soldering does not necessarily replace a wave machine, because wave soldering is still the most efficient method of processing boards with only through-hole components. But Selective is essential for a mixed technology board, and depending on the nozzle type used, can replicate the wave technique in a compact way. Jet (or Wave) soldering is similar to wave in that it’s uni-directional and provides the same benefits as wave. Its smallest solder diameter is 4mm, it requires minimal maintenance, and it is fairly low cost. The nozzle type you use will depend on the make-up of the board and the location of SMDs on that board. For instance, a fairly large row of connectors/leads not in close proximity to SMD components could use a wide nozzle to swipe (or wave) the entire row at once. A small area closed situated to an SMD would require a very small nozzle to avoid disturbing the surface mount device. Jet nozzles attack the board at about the same angle (7) as a Wave machine, and can deliver a high volume of solder using a tapered tip which guides solder roll-off in one direction returning unused solder back to the pot from its trailing edge. In this scenario, the direction of travel (board or nozzle) is very important. 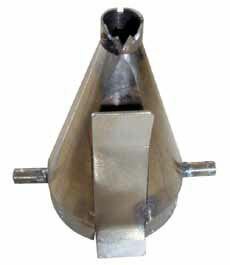 Jet nozzles are long-lasting and usually cost only a few hundred dollars. Some boards can benefit from a custom nozzle to solder an area as quickly as possible in a dip or drag process, or even a min-wave. Pros: Many nozzle types, including custom configurations, can be used for most efficient speed and high quality, if the board population permits it. Cons: Boards (or solder pot) can only move in one direction making programming a little more complex. Wettable nozzles create a uniform bubble by virtue of the surface tension of the solder. Excess solder rolls off around the entire surface of the nozzle, rather than in a single direction, thus producing less turbulence from solder roll-off and helping to preserve solder quality. For this reason, a wettable solder can move in every direction, 360 degrees, or in either the x or y direction, and it is easy to control the bubble height. This combination provides maximum flexibility for a large variety of boards. Wettable nozzles provide finer accuracy than jet type which makes it better suited to connections in close proximity to SMDs. It also produces less oxidation because there’s less contact with air. For this reason, wettable nozzles are also best suited for lead-free solder which tends to be more vulnerable to oxidation. Pros: Provides pinpoint accuracy for highest connection integrity on densely populated boards. Cons: Costs more than Jet wave and requires daily maintenance to prevent clogging. Custom nozzle capabilities can be made to cover very large areas of a circuit board in a single pass while masking SMD components to speed production. Contract manufacturers who assemble a wide variety of board configurations should make sure the machine they’re investigating can accommodate both types of nozzles and/or custom/hybrid configurations if they think they are ever going to need them. Which is better: Moving the board or the nozzle? Jet wave nozzles can only attack the board in a single direction, much like wave machines. The design of wettable nozzles permits a flat angle of attack, so the board or the solder pot can move in any direction. Whether you choose a machine that moves the board or the nozzle depends entirely on your process application and the most efficient means to achieve it while retaining as much flexibility for other applications as possible. Most machine manufacturers can recommend the best situation for your needs, and can also fabricate custom nozzles for special applications. 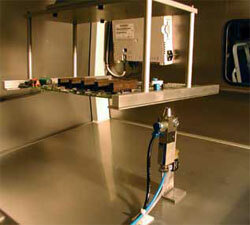 Nitrogen inerting is an advisable and low-cost option on a Selective Soldering machine. Two systems are available: one that uses nitrogen bottles which require replacement and recharging, and those that use a commercially available nitrogen generator. Some nitrogen systems incorporate a pre-heat stage which can also be used to activate the flux, performing two functions at once and eliminating the necessity of a separate flux pre-heater. Nitrogen improves soldering performance by assisting thermal capability and improving surface tension of the solder. Leaded solder is considerable more forgiving than lead-free in terms of oxidation, degradation and connection quality, so nitrogen is not always needed in those cases. However, it is absolutely necessary for any application using lead-free solder. To ensure a good solder joint using lead-free, the nitrogen bubble protects the solder integrity during the process with no voids in the final connection. Hybrid boards can be challenging to program because of the interface with SMT components and the nature and arrangement of addressable, through-hole points. Figuring out the best sequence to optimize production speed is usually a combination of common sense along with available software features. Starting with the last one, the Teach-In method is no longer widely used because it can be more difficult to manage than the other methods, which are also far more common. More often than not, if a board has been designed in a CAD system, using the exported data will result in the easiest and most reliable method of importing the data. This data is known as a Gerber file, a 2D vector file that describes everything about the board for manufacturing, as well as populating and assembling them. It defines multiple layers of images that make up the board, including the size of pads, centroids, through-hole locations, etc. Once the board has been acquired, the methods for programming the board vary widely, so evaluating the available methods against your particular processing needs will help guide the selection process. It’s easy to add expensive bells and whistles, but for a low volume application or shop, they may not be necessary. On the other hand, some medium to high volume applications will benefit significantly from the time-saving options that improve productivity. Software for Selective soldering machines is nearly always hosted on an offline PC. The idea is to import the board data, whether it’s a visual representation from a scan or photo, or from a digital Gerber file, then scale its length and width on the computer screen to match the physical dimensions of the board itself. So, now that the board image has been imported into the software, it appears as an overlay of the coordinates of the points behind the board image. 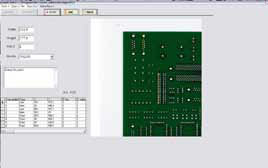 With a simpler software interface, additional PCB data may need to be entered (In addition to the border and size of the board) – such as all the solder process data (temperature, preheat speed, preheat dwell), as well as the up/down Z-axis speed . Selective solder is not just a pattern of dip points on a board. It also represents opportunities to drag solder across multiple points without changing the elevation, or height (Z), from the board. Furthermore, if nozzle changes will be necessary to accomplish some solder operations, they should be minimized to reduce dead time. On some boards, using a single nozzle to perform less efficient operations than would otherwise make sense for a different nozzle may still be faster than a time consuming nozzle change. A good software package will be intuitive and easy to use. And while many of these decisions can be made by a thoughtful and experienced board programmer, some sophisticated software packages offer optimization tools to achieve the best pattern for complex board geometries. Such software packages will, along with the judgement of the operator, be capable of deciding whether changing a nozzle would be advantageous or not. NOTE: If nozzle changes are dictated, they must be done manually. The machine interface will alert the operator any time there’s a manual operation to be performed. As the operator defines how the board will be processed, the software will prompt the user to instruct the machine what to do at each point or drag selection. Typically, the default command is to flux, preheat and solder each contact at one time, then change the nozzle height and move on to another selection; however, there may be special cases where the board design may require handling some of the operations separately. That flexibility is key if it’s important for your board production. After the board has been configured, the file is sent to the machine to begin processing. Most software programs have a menu option that allows for easy download of the saved program to the machine controller, usually via a serial, USB or Ethernet connection. The Selective Soldering machine you buy will always offer its own software; however, if you like the machine but its software isn’t exactly what you want, you can often purchase a third-party program which can also export the formatted board back to the machine. Any respectable machine manufacturer will offer a free demo version of their software for you to evaluate before purchase. It will allow you to see how easy (or difficult) it is to import graphics files, configure them, and program special circumstances that may arise in your production routines. As mentioned earlier, many suppliers offer lots of time-saving capabilities with their software, but a good rule of thumb is to test drive a number of different types to find your sweet spot, which will be a balance between performance and price. There’s no need to pay more for a capability that you will rarely use. A trial will also quickly help you decide whether the software will be easy for your staff to learn. Use patience in your evaluation process. Every manufacturer’s software is very different from the other’s, meaning there’s very little uniformity among Selective programming routines compared with what you may experience in other assembly processes. But choosing a Selective machine is a major investment, and it deserves any amount of time you can afford to give it a proper evaluation. Selective soldering is often touted as being the “latest and greatest” but it’s not the best technology for all boards. The fact is, selective is a much slower process than wave because it has to process each lead or closely spaced set of components one at a time. Selective is the only way to solder through-hole components in a production environment on a mixed technology board or if there are obstructions on the underside of the board. But wave soldering is by far the fastest way to preheat, flux and solder a board with only through-hole components. Wave soldering dates back to a time even before integrated semiconductors were used, so it’s not a new technology. However, there have been many advances to the equipment as the industry has evolved, and it remains a very effective and cost efficient manufacturing/assembly method to this day. No technology can match it for speed and no other method can improve on its joint strength. Selective soldering is becoming much more common today, for very good reasons. 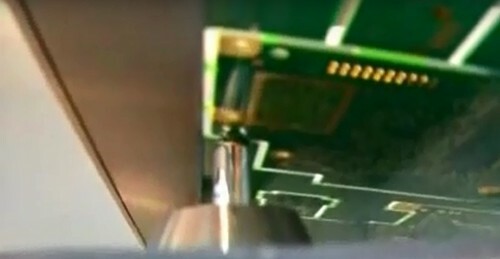 It can process through-hole components on boards with mixed technologies, multiple shapes, patterns and devices; it is significantly faster and more reliable than hand soldering, so it’s a natural step up from a prototype setting to a production routine; once programmed, recipes can be archived to perform the same operation in exactly the same way in the future, ensuring reliable repeatability. And this is where Selective Soldering shines. There are myriads of standard nozzle designs for performing dips and drags, and they are limited only by your imagination or the complexity of the board. Selective gives you many ways to tackle a soldering routine, so you want to think about the sequence, the nozzle configurations you use, and the best way to save processing time. It may make sense to buy a custom nozzle if you have a high volume board with a unique profile. After all, nozzles aren’t very expensive and they last quite a long time. Perhaps you’re considering the acquisition of a Selective Solder machine for specific new project, or you’re a contract assembly shop expanding your offerings to handle custom configurations. Look beyond the immediate future and think about how your needs may grow. Some Selective manufacturers can offer a base machine that allows for the addition of future modules to expand your capabilities. But some don’t, so be sure to ask. Additional modules can come in a number of formats, allowing you to double or triple your production throughput. You may be able to get them combined in pairs to perform two operations on the same lead, or get separate modules that only perform a single fluxing, preheat, or solder operation. Beyond modules, some manufacturers offer automatic conveyors which allow the operator to stage boards and feed them automatically when a previous board is complete. This allows one operator to perform multiple functions rather than keeping his attention on a single machine. As described earlier in Selective Soldering Part 4, hybrid boards can be challenging to program because of the interface with SMT components and the nature and arrangement of addressable, through-hole points. Figuring out the best sequence to optimize production speed is usually a combination of common sense along with available software features. The two best ways to “acquire” the board into the system are by scanning the board or importing CAD data from a Gerber file, although in a pinch, you can also take a digital photo. With more advanced programming options come higher costs, but they often pay off in greater efficiency and throughput. Click here to contact DDM Novastar for information on Selective Soldering or other machines.